Saturday June 1 is SOLD OUT from our hotel block at the Marriott Pinnacle Vancouver Hotel. Rooms are still available from Wed May 29 to Fri May 31. *Are you a UBC Clinical Faculty Member? MAID2019 is not open to the public. NOTE: Registration fees are discounted for CAMAP members. If you would like to join CAMAP now and enjoy the reduced costs of registration, please click here. Please complete these additional fields for our records. If this is a renewal, please ensure your information is correct and up to date. CAMAP offers a closed mailing list/forum open to assessors and providers. If you are an assessor or provider, would you like to join? Would you be willing to take MAiD assessment referrals from the general public, or from other medical professionals? 5% GST will apply on all conference fees, pre/post conference workshops and social activity. Course Description: Join with your colleagues from across the country to learn about one another’s programs in coordinating patients, assessors and providers in medical assistance in dying. Discuss the benefits of various models of support, as well as common challenges and innovative solutions in this new and dynamic field of health services delivery. Researchers investigating various aspects of care coordination will speak about the progress of their research, and there will be ample opportunity for dialogue and networking, exploring improvements for the clinical team, family and friends, and - most importantly - the patient experience. Note: This is not an accredited course. 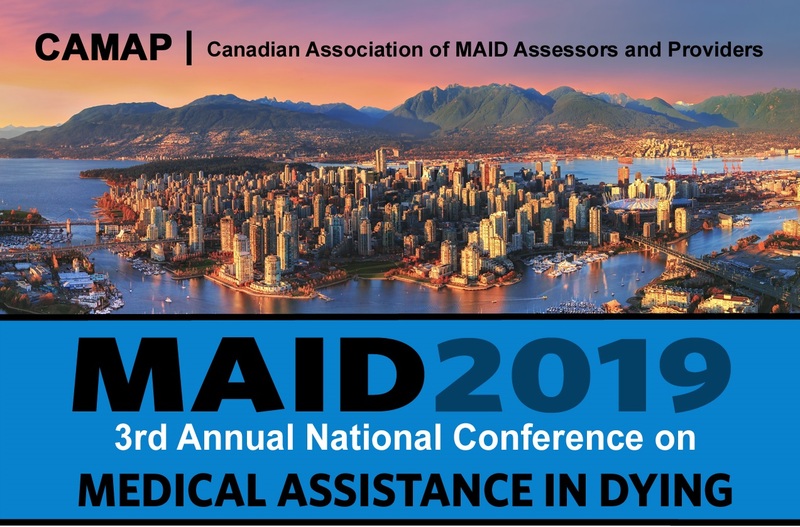 Course Description: This Introduction to performing assessments for MAiD will review current interpretation of eligibility criteria and through a number of case scenarios allow participants to develop an approach to interview and evaluation techniques. Participants will also be introduced to resources for more complex assessments, and an outline of the provision of MAID, with a focus on the community setting. Course Description: In the Research Forum, researchers will present peer-reviewed oral abstracts on various aspects of Medical Assistance in Dying. This session will facilitate dissemination and discussion of current scholarly activities investigating MAID. Potential future research projects and collaborations will also be explored. Course Description: One-day introductory palliative care course for health professional teams working in the community. Provides learners with the essential, basic competencies of the palliative care approach. Ideal for established teams, enhancing teamwork, promoting inter-professional collaboration, enhancing collaboration amongst providers in different agencies who need to work together. Accreditation: up to 16.50 Mainpro+ credits. No refunds or transfers, unless you cancel in writing to [email protected] by March 28, 2019 for a $50.00 fee. Registrations are not accepted fewer than five days before the conference start date. Please contact our office at [email protected] regarding the availability of on-site registration.